I have been reminded by my wife that my blogging career has taken a serious turn for the worse of late, and that I have shirked my duties. My apologies. It is hard to believe that 2012 is almost half over and that we are around 60 days from starting the new harvest. Where has the time gone? After the challenging 2011 harvest, we set about pruning the vineyard after Christmas with the intention of building the vineyard back slowly. This was done by reducing the number of buds on the vine and by using a new pruning method called cane pruning. In the past we have spur pruned, whereby 3-4 spurs [each having 2-3 buds] are left on each of the cordons. Cane pruning involves laying down a one year old shoot, leaving 6-8 nodes, thereby establishing a new cordon each and every year. The primary reason for cane pruning was to allow us to remove cordons and shoots that showed incidences of phomopsis. Phomopsis Viticola overwinters as Pycnidia on infected wood between one and three years old. When the Pycnidia are wet, they exude spores that are splashed onto developing shoots. These spores then germinate in warm temperatures and, under conditions of high humidity, infection can take place within a few hours. This is one of the challenges facing growers as fruit and the rachis [main axis of the inflorescence of Vitis vinifera] can become infected during the course of the growing season. When fruit starts to ripen in the latter stages of the growing season the pathogen becomes active, leading to fruit rot. Symptoms include browning and shriveling, almost resembling black rot. Pruning is done during the winter while the vineyard is in a dormancy phase. This year, however, mother nature thought that 70 degree days were called for; great for pruning in shorts but not so great when it leads to an early bud break. We started noticing some cuts starting to bleed [due to osmotic forces pushing liquid from the roots], which is one of the early signs that vines are starting to break dormancy. Our vineyard duly had bud break March 22nd, while we were still frantically trying to complete the pruning of the vineyard. 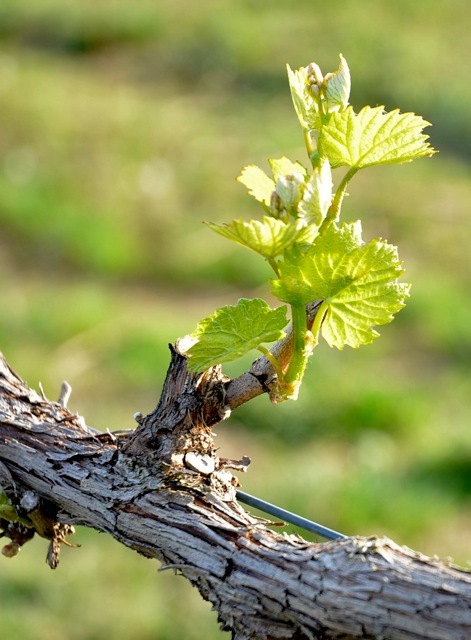 One of the issues of an early bud break is the susceptibility of the vines to spring frosts and, true to form, Mother Nature obliged and threw seven days at us where temperatures were below freezing. We experienced a radiation freeze, marked by beautifully clear skies and no wind. Under these conditions, air stratifies near the ground and radiant heat loss occurs from the ground and vine tissues. One of the most unappreciated times of the morning has to be 4am, or so we tell ourselves when we are forced to get up. Wind machines were run, frost dragons were making their way through the vineyards and raging fires were tended to, all trying to raise the ambient temperature to protect our vineyard. We did lose some fruit, estimated at about 5% in the Chardonnay, but for us that is a minor miracle. Thankfully we had anticipated such an issue and had purposely left more buds, the frost basically just thinned the crop. Flowering and fruit set occurred with no major issues, and I am happy to report that we have a full crop thus far. I touched on the fact that we have been experimenting with slightly different training techniques and since last year gave us no good indication of how effective our new systems are, we are once again trying to grow in the fruit in a slightly different way. Conventionally, vines are trained vertically in a series of catch wires, aptly named the Vertical Shoot Position [V.S.P]. We, however, are experimenting with a split system or divided canopy, whereby only 50% of the shoots are trained vertically while the rest of the canopy is allowed to hang down. There are a couple of thought processes with regards to this system. Our primary soil is clay which leads to pretty serious vegetative growth. In our climate marked by warm temperatures and high humidity, we have to be mindful of diseases. By splitting the canopy we feel we can create and an environment that allows greater air movement through the canopy and better sunlight exposure, which ultimately suppresses the disease pressure and, more importantly, better ripens the fruit to produce grapes with more intense flavors. Our best fruit, which grows on some of our poorest soils, are still trained vertically because vigor and retention of water does not pose any serious threat to the quality of the vines and thus the fruit in these areas. At this point in the vineyard we are trying to ensure the vines and vineyard are in balance, ensuring that we leave the optimum amount of fruit that will be harvested at ideal picking parameters. We are currently pulling some leaves on the East side of the vines, exposing the fruit on the cooler side as sunburn is a serious threat with temperatures forecasted to reach the 100 degree mark in the next few days. A lot of people ask us about the attitude towards diseases and what we do to combat it. The honest answer is that we have a detailed spray schedule worked out, whereby we spray what is needed, when is needed and most importantly how little is needed. It would be fantastic to talk about organic grape growing, probably even more marketable would be the term “biodynamically farmed”. 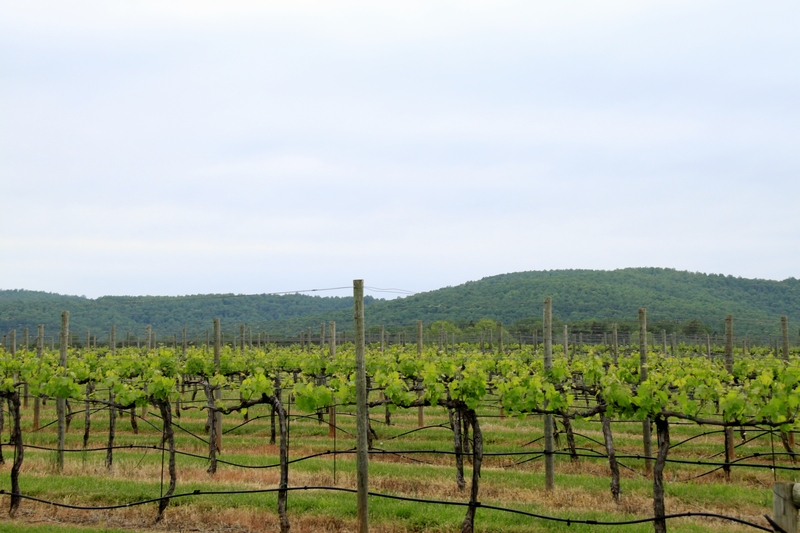 The truth of the matter s that Virginia’s climate [in my opinion] does not allow the wine grower to farm organically. We would lose our crop to everything ranging from Downy and Powdery Mildew, to Black Rot, Japanese Beetles and Aphids. We rotate sprays so that the vineyard does not build up any resistance and we ensure that our sprays are stopped well in advance of harvest, so that no residual spray materials come in on the fruit. The vineyard looks to be in great shape right now, we have plenty of fruit, no diseases and, more importantly, I think we have the balance right. Unfortunately a lot can change between now and harvest, as the weather has the final say and pretty much determines if we can one day look back on 2012 and say that it was one heck of a vintage. All we can do is chug along and look after what we can. 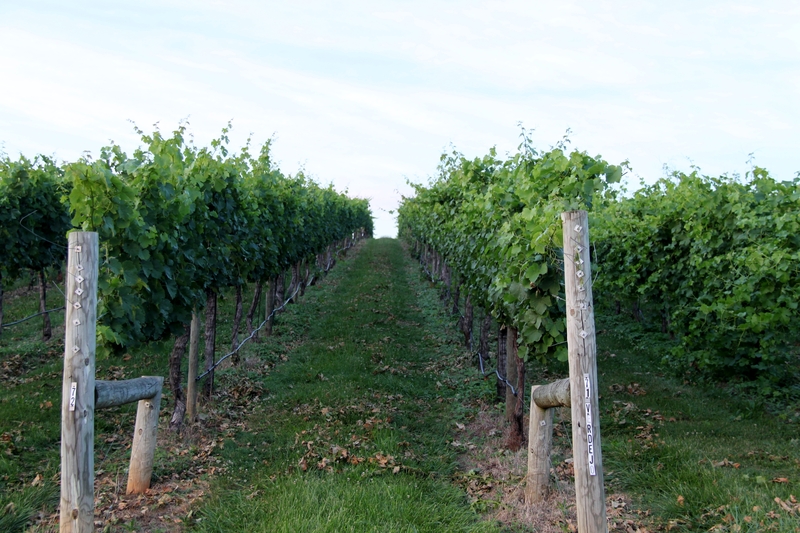 I am cautiously optimistic about this years harvest, what will be the 11th harvest at Keswick Vineyards. I will chat with you soon about some of the exciting wines to be released in the upcoming months. This entry was posted in Uncategorized and tagged bud break, cane pruning, frost, harvest, Keswick, Keswick Vineyards, organic, phomopsis, spur pruning, trellis sytems, vsp. Have you at any time experienced a truly unforgettable glass of wine?